Seahawks’ first win since December merited a righteous celebration, but Earl Thomas made Sunday about him by playing well and talking about practice like Allen Iverson. The Seahawks offered up a multi-layered response Sunday to the crappiness of the season’s first two weeks, including a run-game renaissance behind a Hobbit-sized backup center. 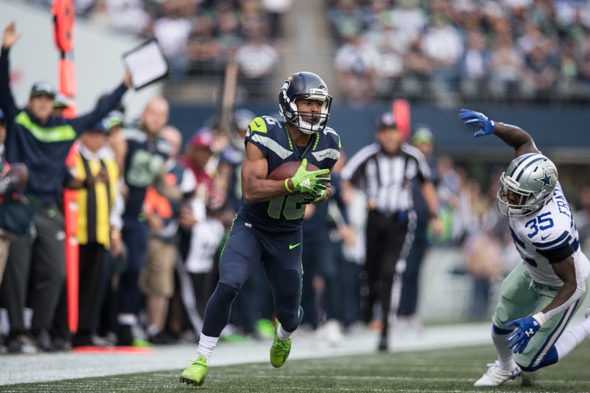 But the 24-13 victory (box) over the remarkably inept Dallas Cowboys shivered in the shadow cast by the latest twists in the saga of FS Earl Thomas. His game Sunday was as good as his post-game chat was bizarre. And his NFL future is as opaque as Pete Carroll’s remarks. “I’ll talk to him next week about whatever,” the Seahawks coach said. “There’s nothing to even tell you about right now. I’ll let you know next week. He is going to withdraw from practice as much as he can to provoke management into a trade (or an increasingly unlikely contract extension), while keeping his teammates’ respect for him, as well as his market value, high. As in: Seven tackles, two interceptions, two forced fumbles and a wicked bow to the Cowboys bench after the second pick that was his f— you for not trading for him. Yet. The gesture drew a 15-yard taunting penalty, but was as theatrically distinctive as the “Z” that a smiling Zorro slashes with his sword into the shirts of those he has subdued. Earlier in the week, Thomas held himself out of practice twice for reasons of neither health nor rest. It was a tiny resurrection of his holdout from training camp and preseason. Thomas said he knew he’s likely to face fines from the team. In front of reporters Sunday, Thomas’s explanation was a distant homage to the epic rant of Allen Iverson. The practice-holdout provocation immediately re-ignited speculation about a trade, with Dallas and Kansas City at the top of the media-guess list. The trade talk, to hear Thomas tell it, reached the Clink field pre-game. If that episode were true, it likely meets the definition of tampering, a violation of NFL rules. But since there is likely no public record and likely no public admission by the Cowboys, the NFL won’t be able to sanction it. That doesn’t mean it isn’t tampering. Asked whether one of the coaches was Kris Richard, the former Seahawks defensive coordinator fired by Carroll and now coaching the Cowboys’ defensive backs, Thomas said no. 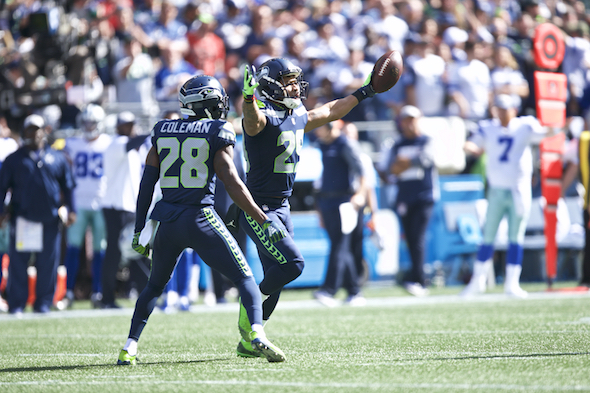 Internally, Thomas’s rebellion sets up a management problem for Carroll: No matter how valuable Thomas is — and he made his case compellingly to the 12s in the home opener — indulging his tactic means creation of a double standard. Not that it hasn’t happened before (see Marshawn Lynch and Richard Sherman), but every time, it causes a headache. Thomas denied it would create a problem within the team. “They know me,” he said of his teammates. “When we’re in the room, it’s straight business, but they also know that I’m going to be me. I’m going to be free. I know who I am in this game — especially in this game. Thomas’s claim of no disruption was backed by QB Russell Wilson. Unless, of course, if he’s not practicing. Not that he’s dismissing the value of practice . . . but he’s apparently making an exception. He’s less cautious about turning the tables on Carroll and general manager John Schneider. As much as they’ve let slide the practice absences of Lynch, Sherman, Michael Bennett and others, they don’t like it all when a player makes the dispute a public spectacle. As those three know, Carroll and Schneider have limits on the rope they give to any players. Now that the threat of playing against Thomas this season in a Cowboys uniform has passed in a successful way, Carroll and Schneider can consider anew whether Thomas is worth the hassle relative to the price he can fetch in a trade. With each passing week ahead of the Oct. 30 trade deadline, teams become either more or less desperate for outside help. At 29, Thomas has proven he’s at the top of his game. The Seahawks will say or do nothing that discourages that impression. In order not to seem so pathetic in the marketplace, it also helps that 1-2 Seattle finally won a football game, even though the past two victories have been against a disintegrating Cowboys team (a 21-12 victory in Dallas on Christmas Eve despite gaining just 136 yards of offense). The most recent non-Cowboys win was Dec. 3, when they beat 24-10 the Eagles, who recovered sufficiently to win the Super Bowl. Since then, the Seahawks lost to the Jaguars 30-24, the Rams 42-7, the Cardinals 26-24, all four 2018 preseason games and the first two regular season games in Denver and Chicago. The question is whether that growth can take place without Thomas, who has heard nothing about a contract extension. Since Carroll said he would address Thomas’s future in the week ahead, the guess here is that the Seahawks have offers in hand that awaited Sunday’s outcomes. “It was a pretty challenging week,” Carroll said of the tumult of last week that included adding convicted felon Mychal Kendricks and injuries to the offensive line. “It was fun. That’s how it goes, and who wants to be dull? Dull has never been an issue with the Seahawks. Smart? That has come up in the past few years. And it will again when Thomas is dealt. Marshawn is with the 0-3 Raiders. Injured Sherman wanted to play with Garappalo, who tore his ACL today and is done for the season. And Earl wants to be traded to the hapless Cowboys. Good times. But we can add two wins to the Hawks season total because of Garappalo’s torn ACL. Best not to count W’s because of injuries. Unless you don’t believe in jinxes. I don’t even know where to begin. This is not what I want to be talking about after our first win but I guess that’s where we are. I thought Russell played a lot smarter and I thought we stuck to the running game for a change. Sure the points come a lot slower but we’ve got to play the long game. McDougal is my new “football” hero. The Rams look like a juggernaut in our division so we better start playing to our highest potential. One more thing…I wish I’d been there for Bam Bam raising the flag. It sounded really loud. Lots to like about the football — improved pass rush and improved pass pro, smarter decisions by Wilson and a willingness to stay with the run even when there’s no seven-yard gains. McDougald is a noteworthy part of life after Earl. I think it’s pretty well established that Earl is unique. Some people possess enough talent that you put up with their unique attributes. Earl is one of them. He’s one of the best Safeties to ever play the game of football, and he’s only 29. Safeties go into their 30’s. Let’s call it the Gruden rule, don’t trade first ballot HOFers for picks, even firsts. Especially when you have John Schneider’s 1st round pick history. EXTEND HIM. The injury history on third contracts is too much for the Seahawks to swallow right now. They lead the league in dead money. They could let him play out the year, then franchise him, but neither party would be especially happy with that. I understand the Seahawks hesitation, they’ve been bit with the late career contract (Avril, Kam, Lynch, Sherm–injured again, etc. ), but I really feel Earl is different. I really hope they can figure this one out. You can build another run around Wilson, Wagner and Earl. That said, I have no idea why the Cowboys would give up any assets considering their dumpster fire of an offense. ET’s not changing that team. I don’t know you know Earl is less likely to be injured than any other 30-year-old player. True. But I’m going with the Eric Weddle, Brian Dawkins, Ed Reed, John Lynch, Steve Atwater type guys who were effective past 30. There are examples. There’s no way Kam was going to last long the way he played. For each guy you can recall, I’m guessing there are at least 10 average or better safeties who didn’t make it that far because of injuries. And here’s why I don’t run an NFL team. The NFL has to fix the CBA. No winners here. I won’t be surprised if we trade Earl but I really, REALLY hope that we don’t. He’s proven that he’s a difference maker and I think we lose at least 3 more games if we trade him than we do if we keep him (i.e. I think he’s the difference between 10-6 and 7-9). Funny how few fans sympathized with Earl’s position during the holdout from camp and preseason. But a few picks and it’s “pay the man,” even if he all but admitted post-game he’s making business decisions regarding his body. I’m not actually sure we should “pay the man”; I just don’t think we should trade him. During the offseason, I would have understood it if we’d traded him. I wouldn’t have liked it, but I would have understood it. Nope that the season has started though and he’s reported for duty (at least in games), I think they should keep him. And not because of the INTs, although those are definitely a plus. I think trading him at this point send the wrong message. At least subconsciously, I think the players would view it as management giving up on this season. More significantly though, it takes away our field general, our center field and weakens the team significantly. Should the team commit to spending ~$15M per session at his position next season (and for the next few seasons beyond that)? I don’t know. But they already committed to whatever Earl’s making this season and I think they should stick with him. In regards to Earl’s attitude and willingness to accept fines sure to his “business decisions” …. I don’t like it but I understand it and even somewhat support (and encourage it). The NFL is a business that treats it’s players as expendable resources and often makes “deliberate” choices about those resources (eg backlashing contacts knowing it will move on from the player before paying the full amount) and then acts shocked and/or outraged and/or indignant when those resources treat their relationship with the team and/or league as a “business decision.”. I understand why they don’t like it but …. “pot, meet kettle” (IMO). Best game since the 24-10 win over the Eagles Dec. 3. Great game, and Earl was great, for sure. And I even have a begrudging respect for his shenanigans. He’s his own man, and he’s shockingly upfront about it all. And he seems to be playing his cards well to put max pressure on the Hawks to accommodate his wishes. Having said that, he’s gotta go. Pete gives his players a lot of slack, but I don’t know how you can tolerate a player basically saying “I’m not part of the team. I’ll just show up on Sunday and be great.” Earl is not bigger than the team itself; that’s what it comes down to. I have two competing (conflicting?) thoughts. First, life in the NFL is short and can be over in a single play. Earl wants his money now. I get it. I also get why the Seahawks are reluctant to extend him, based on recent history. Second, these 20-something athletes living in the moment and in the bubble believe that they are bigger than the team or the game. Five years from now, Earl will be remembered as a great player, but won’t be a consideration in what will be the “next” Seahawks team. Remember the holdout of Joey Galloway? Yeah, neither do 97% of today’s Seahawks fans. As a longtime manager in business, my mantra was to hire slowly and fire quickly. Once someone doesn’t want to be there, it will not work. That person will be acting up (missing practice, and threatening more, like a headache) and will ultimately be a distraction to everyone around them. The Hawks should have unloaded him before the draft, but that ship has sailed. He needs to be gone this week. This is a 6-10 team, and Earl Thomas will not be a difference maker in a rebuilding season. If Earl “loses” his teammates as a result of his actions then I (mostly) agree with your assessment. But reports indicate that his teammates understand his position and, although they may not like it, they support it. And his game performance isn’t suffering so I think you keep him and continue to ride your prized stallion until he throws you off. In regards to this bring a 6-10 team, I disagree. Without Earl, sure … maybe. But they’re at least 3 games better with Earl than without and I don’t see them only winning 6 games if they keep them. Even in a rebuilding (or “retooling”) year, the team could make the playoffs if they play “Seahawks football.” (IMO) .Assuming, of course, that they keep Earl and his teammates keep supporting him. One player in football (11, 11 and special teamers) is worth 3 wins? Don’t see it, unless that player is Tom Brady. One player in basketball? Yes. Football? Nope. Thanks Art! Fun game to watch. Seems like maybe the coaches are a bit more prepared to coach a live game together now. Hopefully this win will lead to more confidence all the way around, even though the Cowpies aren’t a huge datum for measuring success. The Seahawks are a young team and growing. Loving seeing all of the excitement on the field and on the sidelines! Earl is one weird dude for sure. BUT, best free safety that I’ve ever seen play. I’m focused on enjoying watching him play for the Seahawks, while he’s still here, as long as he’s not a distraction to the rest of the team. Sounds like he isn’t, but the resistance to practice and the universal questioning about it is still barely a week old. He’s having fun on the field, and his team mates are also, along with him. The number of games he has before anti-practicing is an issue too large for the team to ignore with be an interesting metric. I’m 100% with you on that, Wise One. The state of the Seahawks will be a composite of this season – and it will be an interesting journey to watch (worthy of graphing?). Last week was an awful wait for the next game. After the embarassment on Monday Night against the Bears, to me, any sign of hope is worth noting and seeing if they can build on it. The jury is still out on the Carroll-Scheider legacy. IF they can turn the program around, even after numerous self inflicted errors, it would be quite monumental. Gotta hand it to them – they do so well at providing fuel for commentary, and in so many new and creative ways. I almost fell on the ground laughing after listening to Earl’s press conference in which he admitted his commitment to practice will reflect what he believes is the teams’s commitment to him. . brutally honest and I admire him for that. I understand both the team’s side and Earl’s side of the conflict thoroughly. . .but to those who say Earl’s got to go I say GET RID OF NON GUARANTEED CONTRACTS FIRST!. . Why is it we had to play 50 plus seasons of football before a player got a fully guaranteed contract?. . . Honestly Earl’s shown a lot more honor in the way he’s gone about things than NFL management ever has. . its about time management stepped up and paid the man based on his performance and not based on who got hurt the last time a SeaHawk player signed a 3rd contract and got hurt after signing. Honor??? Mark, I guess you don’t understand that Earl Thomas signed his name to a contract that he and his agent negotiated and agreed to. He is under contract. I guess his word and his signature don’t have much meaning. I would say that your understanding of Earl’s position falls short of mine Husky Brother. . .
Again, Mark, it’s all about the CBA, not justice. “Earl’s position” is that he has a contract. His contract has not expired. He signed a contract that continues in force. If management honored contracts nearly as much as players do. . there would be no such thing as a non guaranteed contract. . management takes more profit and assumes less risk. .how honorable is that? Those are questions for the Players Association. They negotiated, agreed to and signed off on the current standard players contract. Don’t blame the owners for being better negotiators and living up to the agreement. Not sure that walking to another team’s locker room to say “come get me” is showing honor to his employer. And the trouble with guaranteed contracts is the team is paying on past performance, but the hard salary cap is all about now and the future. Art when you consider player’s have been playing under the premise (while risking life and limb) that at any second signed contracts with 2, 3 and sometimes 4 years still left on them can be completely ignored by management as the player is shown the door for whatever reason management deems fit (merit be damned) I don’t see Earl’s action as necessarily dishonorable in comparison. And frankly you’ve uttered tactical management speak in your reply that contracts are paid based on past performance. You’re telling me prospect of future performance is not to be considered unless the player is a rookie? Common man. . You’ve spoken like an Owner . wink. wink .lol. .the way they’ve always spoken in order to keep from guaranteeing a contract which by the very essence of the language “contract” should have been something more of a guarantee like Kirk Cousin’s contract is. .rather than what Earl Thomas has now. Mark, you’re forgetting that this “tactical management speak” reflects the collectively bargained agreement between owners and players on the business rules of the game. Fair or not, Thomas and his colleagues have accepted these rules. If the players make a priority of guaranteeing all contracts, that has to be negotiated into the next CBA. For now, it remains an option for management, and Cousins appears to be the first with complete guarantees. Part of the current contract calls for injury settlements. If the amount seems paltry, it’s up to the players to negotiate improvements.